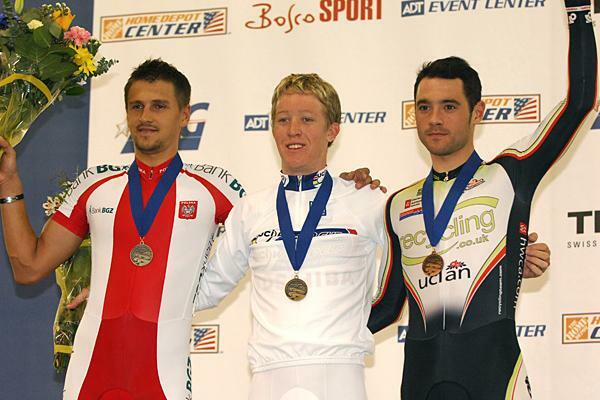 On day 1, Britain fielded three riders in the Men's Points race. First year senior, Peter Kennaugh, a former World Junior champion, showed the form he has at the moment winning the first heat after an aggressive ride. Kennaugh's fellow Isle of Man rider, Jonny Bellis was 10th and failed to make the final. In the second heat, former World Points Champion, Chris Newton, getting in amongst the action after a conservative start, won sprint three and with the other points he gained, the Recycling rider made the final after finishing second. 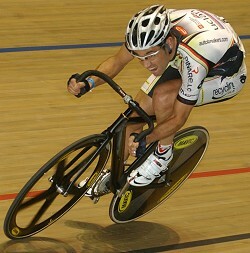 In the final, Chris finished third, gaining 15 points with Aussie Cameron Meyer winning the race after two sprint wins. Peter Kennaugh was a DNF in the race. Newton again felt his way into the race missing points on the first two sprints but then scoring three in the third sprint followed by another 3 in sprint six, 2 in sprint seven, 1 in sprint ten, a win for five points in sprint eleven and a final point in the last sprint to get the bronze medal. Chris's third place means he lies in second place overall in the World Track Cup competition for the event, five points behind Meyer. Chris finished second in the Beijing World Track Cup and 6th in the Sydney Track World Cup in the first two rounds of this years World Track Cup competition.